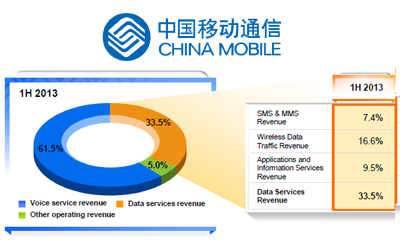 China Mobile, the world's largest mobile operator, reported operating revenue for the first half of 2013 reached RMB 303.1 billion (US$49.58 billion), up 10.4% over the first half of 2012, while revenue from telecommunications services was up 6.8% to RMB 285 billion. Net profit increased 1.5% to RMB 63.13 billion. Customers over 740 million, up 8.4% from 683 million at 1H2012. Data services revenue rose to 33.5% of revenue from telecommunications services. 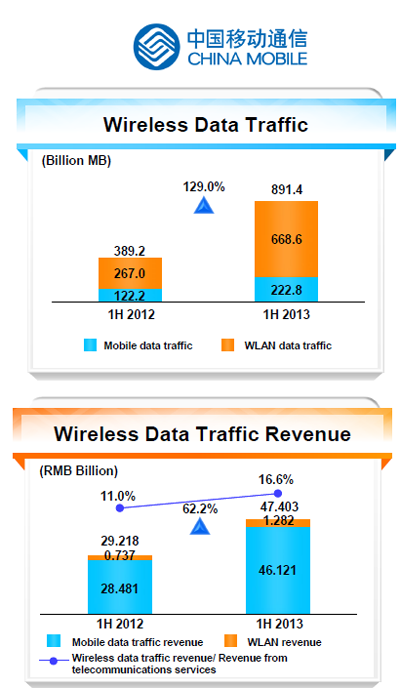 Wireless data traffic revenue up 62.2% while wire data revenue grew 129% over 1H2012. 3G customers are now over 137 million. 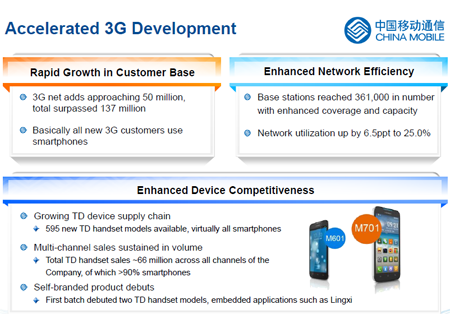 The company plans to deploy >200,000 TD-LTE base stations in 2013. So far, China Mobile has 25 TD-LTE trial devices, >100 models under development, of which 15 handsets intended for commercial use. 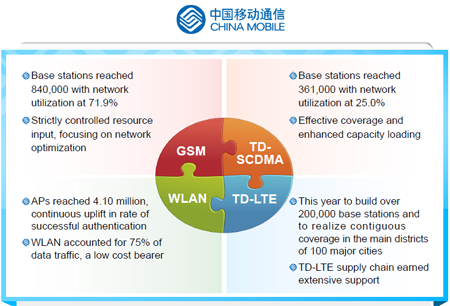 China Mobile plans to procure < 1 million TD-LTE devices this year. Voice usage was up 3.7% to 2,061 billion minutes. China Mobile's transmission network increased by 23,600 of fiber route miles since last year. China Mobile's app store has 336 million cumulative registered customers. There were 506 million application downloads in 1H2013. 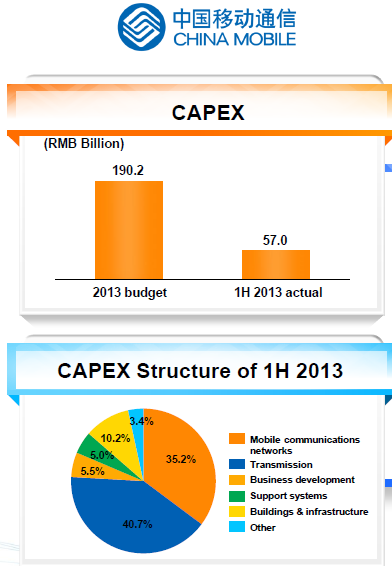 In 2013, China Mobile aims to realize a 15% decrease in power consumption per unit of business. Looking forward, the company says its top challenges include China's Slowing macroeconomic development, rising mobile penetration, increasing notable OTT headwinds, and ntensifying competition among operators. Vodafone Iceland has signed a contract for capacity on Emerald Networks's new submarine cable system, "Emerald Express", which is a new-build system connecting North America to Europe, with a branch to Iceland. 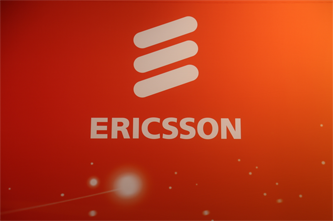 The system is scheduled to be ready for service in Q3 2014, and Vodafone Iceland plans on using it for communications for at least the next 15 years. Vodafone is the first Icelandic company to sign a contract with Emerald Networks. The cable landing station in Iceland is in the vicinity of Grindavik, and Emerald will provide backhaul to Reykjavik and on the Reykjanes Peninsula. 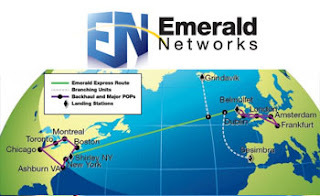 Emerald Networks' submarine cable system span 6,700 km along the "Great Circle" route connecting North America to Europe via Iceland. The company has previous calculated that this northerly route will have a latency of less than 62 milliseconds round trip from New York to London, making it one of the fastest networks across the Atlantic. 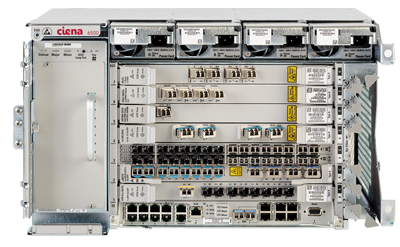 Fujitsu Network Communications’ FLASHWAVE 9500 Packet Optical Networking Platform and FLASHWAVE CDS Micro Packet Optical Networking Platform have achieved Carrier Ethernet (CE) 2.0 certification from the Metro Ethernet Forum (MEF). Specifically, Fujitsu’s FLASHWAVE 9500 is now MEF CE 2.0 certified for E-Line, E-Access, and E-LAN services and the FLASHWAVE CDS Micro Packet Optical Networking Platform is now CE 2.0 certified for E-Line and E-Access services. 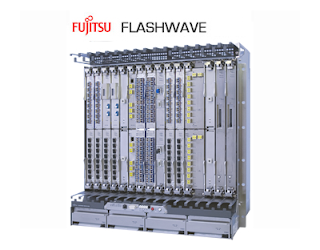 Fujitsu’s FLASHWAVE 9500 integrates Carrier Ethernet, ROADM, and SONET/SDH technologies. With the addition of the MEF certification, the FLASHWAVE 9500 forms a unified CE 2.0 Ethernet service delivery platform that can deliver any of the MEF services over any type of access network. The FLASHWAVE CDS system is an access and aggregation solution for mobile backhaul and commercial/enterprise Ethernet services. “Achieving MEF CE 2.0 certification on our FLASHWAVE platforms is an important milestone for Fujitsu. 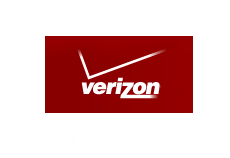 With this certification, we are assuring customers that our solutions enable standardized, interoperable services with which Service Providers can offer world class carrier grade Ethernet connectivity while creating new revenue generating opportunities,” said Rod Naphan, Senior Vice President, Planning, Fujitsu Network Communications. T-Mobile USA will sell $500,000,000 aggregate principal amount of its 5.250% Senior Notes due 2018 (the “Notes”) in a private offering. The offering is scheduled to close on August 21, 2013, subject to satisfaction of customary closing conditions. 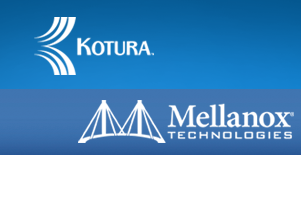 Mellanox Technologies completed its previously announced acquisition of Kotura, a developer of advanced silicon photonics optical interconnect technology, for a total cash purchase price of approximately $82 million. Kotura holds over 120 granted or pending patents in CMOS photonics and packaging design. The company has made a number of ground breaking innovations in optical interconnects by integrating multiple high speed active and passive optical functions onto a silicon chip. Kotura’s current location in Monterey Park, California, will serve as Mellanox’s first R&D center in the United States. Silicon Labs introduced a low jitter, low power timing solution for high-speed networking equipment based on the Synchronous Ethernet (SyncE) standard. The new Si5328 precision clock multiplier and jitter attenuator boasts jitter performance as low as 263 femtoseconds RMS and is fully compliant with ITU-T G.8262 SyncE clock requirements including EEC Options 1 and 2. The SyncE clock can generate any output frequency ranging from 8 kHz to 808 MHz and from any input frequency from 8 kHz to 710 MHz. 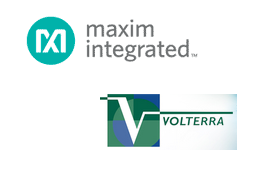 Maxim Integrated Products agreed to acquire Volterra Semiconductor Corp. (NASDAQ:VLTR) for $23 per share, which represents a 55% premium to Volterra Semiconductor's closing share price on August 14, 2013. The transaction value is approximately $605 million equity value or $450 million net of Volterra's cash position of approximately $155 million.